Welcome to Rose & Jim’s Taxi & Tour Service web site. 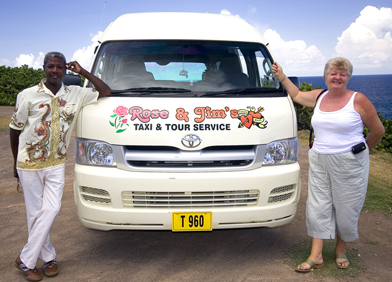 Rose & Jim are premier Taxi and Tour guides in St Kitts, their sole aim is to make your stay in St Kitts as memorable as possible by showing you the best that the island has to offer. Rose & Jim's Taxi & Tour Service use modern mini buses that are very comfortable, spacious and up to date with all the luxuries you require, so you can simply sit back and enjoy the views of our beautiful island of St Kitts. If you would like to arrange a tour with Rose & Jim's Taxi & Tour Service, or you simply want more information about St Kitts and what it has to offer, then please contact us to discuss your requirements.